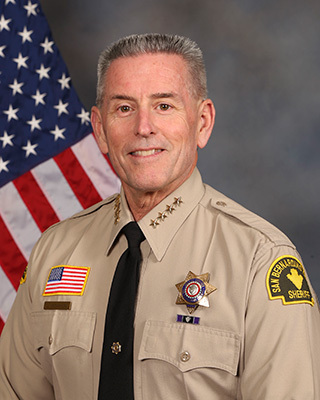 The most innovative school safety program in the United States is right here in San Bernardino County: the Sheriff’s Operation CleanSWEEP program. Launched on three high school campuses in 1997, this comprehensive, all-inclusive effort to protect county students is unique – the only one of its kind. How so? Because it is the only juvenile citation program in the country that empowers school administrators to write real citations for students who break the law on campus. Every other juvenile citation program employs peace officers to write the tickets, but in San Bernardino County, we’re putting this extremely effective disciplinary tool in the hands of the school people who know their young people better than anyone else. The results have been outstanding: principals and assistant principals tell us they appreciate very much the flexibility of having an additional method of discipline at their disposal. Youngsters receiving citations for such crimes as littering and possessing tobacco products and alcohol, face fines, but they also face the kind of diversionary programs that can help them avoid trouble with the law in the future. Students at participating CleanSWEEP schools know beforehand that citations can be issued by administrators and students receive a verbal warning first, when caught in an act that could have resulted in a ticket. As an added safeguard, deputies examine each citation before signing off on it and they make sure it is properly written, with all the elements of the crime included. Deputies can always reject a ticket if it is not adequate in any way. In addition, citations written by CleanSWEEP citewriters are all handled as infractions in court, even though the crimes themselves are misdemeanors. This is another benefit of the program for young people, as the very same ticket written by a deputy off campus would be handled as a misdemeanor. CleanSWEEP is, after all, a “first time offender program”, whose purpose is to get erring kids back on the straight and narrow with a courtroom appearance – not to create a “criminal record” that will follow the minor through life. But that’s not all. As we said, CleanSWEEP is a comprehensive, all-inclusive school safety program. That means we are involved in all aspects of campus security – from digital school security assessments to on-campus presentations of interest to the staff and student body, to training events that range the gamut from table-top exercises to full-scale “Columbine”- style active shooter simulations. Whatever the issue may be, if it pertains to school safety CleanSWEEP is there, on approximately 100 campuses around San Bernardino County, helping administrators keep the peace and helping prevent criminal activity. Many top education officials are looking for alternatives to suspension and expulsion when it comes to students who break the law at school; a CleanSWEEP citation is just such an alternative. It holds the young man or woman accountable for his or her conduct, but keeps offending students in the classroom at the same time. This is only one reason why so many principals tell us that they wouldn’t want to be without Operation CleanSWEEP.